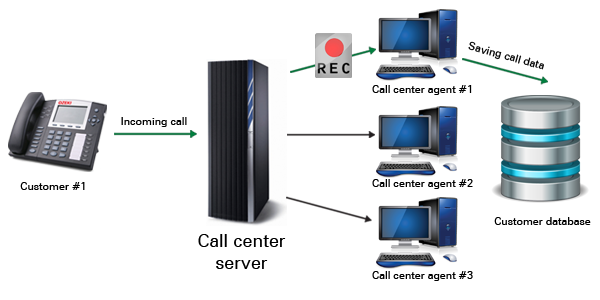 In order to provide extended and professional technology for development, Ozeki VoIP SIP SDK also makes it possible to record calls and call details on a customer datasheet for both incoming and outgoing calls. This page offers some introduction in this topic and links leading to the respective developer guides with source codes. Customer relationship management (CRM) systems are based on customer information collected during communication with the given customers. This information is easy to get when you use VoIP solutions provided by Ozeki SIP SDK for your CRM system as the VoIP calls can be easily recorded and replayed any time. The information you gain from the customer communication can be stored on customer datasheets that are forms about some standard information about all customers like customer ID, the service the given customer purchased, etc. Datasheet manipulation can be done during the actual calls or after the call and it can be done both manually and automatically. The CRM implementations can manipulate some automatically gained caller data like the caller SIP account or alias. This information can be put on the datasheets automatically. The customer datasheets can be used in later customer calls by the company employees for having all the previously gained information about the history of the customer. Ozeki VoIP SIP SDK provides the support for getting information about the incoming calls that can be stored on datasheets. The actual implementation depends on your company's business logic but the professional background is provided by Ozeki VoIP SIP SDK. If you want to learn more about the example program concepts, please check the above mentioned articles and after that you will be able to implement your own solution for CRM purposes.